'Picturing Mary' takes a look at the most common female subject in Western art history. 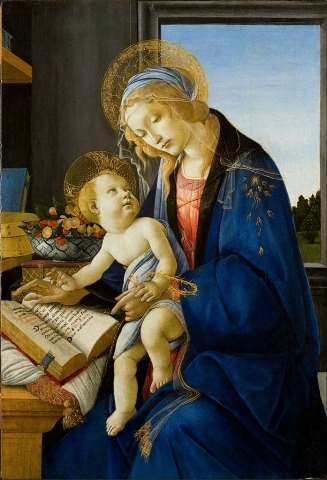 If visitors to "Picturing Mary: Woman, Mother, Idea" were to see only one work—Sandro Botticelli's poetic "Madonna of the Book"—a stop at the National Museum of Women in the Arts for this special exhibition would be well worth the trip. "Madonna of the Book" (c. 1480-81), on loan from the Museo Poldi Pezzoli in Milan, is surely the star of "Picturing Mary," a welcome look at perhaps the most common female subject in Western art history. But overall, this exhibition of paintings, sculptures, enamels, works on paper, textiles and stained glass is surprisingly uneven, considering that Mary has inspired so many great artists, especially during the Renaissance and Baroque periods, the exhibition's time frame. Here, alongside notable works by Caravaggio, Dürer, Rembrandt and Mantegna are many by less-skilled artists. The museum's main mission is to showcase female artists, but that is not where the show's fault lies; only 11 of the 70 works on view were made by women. This museum also presents exhibitions about the portrayal of women, and to demonstrate the pervasiveness of Mary's image it wanted to present the gamut, including works made for wealthy patrons in sophisticated cities and for humble communities in provincial outposts. Exhibition curator Msgr. Timothy Verdon, director of the Museo dell'Opera del Duomo in Florence, borrowed not only from museums including the Uffizi Gallery, the Vatican Museums and the Louvre but also from parish churches. The oldest object here is a marble "Madonna and Child/Seat of Wisdom" (c. 1318-19) by Tino di Camaino, and by that time Mary was already starting to evolve into a more human figure from a remote, formal one. The artworks here show her in a range of situations and guises: from young nursing mother, to witness at the Crucifixion, to dying icon surrounded by the faithful; from Bolognese peasant to Florentine aristocrat; from Mary in the wilderness on the flight to Egypt, to Mary assisting her cousin Elizabeth at the birth of John the Baptist, to Mary, Queen of Heaven. Still, I suspect most eyes will be drawn to the dozen or so masterpieces, such as Caravaggio's "Rest on the Flight into Egypt" (1594-96). In this early but ambitious picture, Caravaggio painted a sensuous angel, back to the viewer and strategically covered by flowing white drapery, playing the violin for the Holy Family. The angel divides the canvas in two, with an idealized Mary asleep, resting her head on the baby Jesus, in a verdant garden setting. In contrast, to the left, a realistically portrayed Joseph sits in a rocky setting, holding a musical score for the angel. Caravaggio invented the whole mysterious scene, which shows the beginnings of his trademark dramatic lighting. Fra Filippo Lippi's "Madonna and Child" (c. 1466-69) is a much simpler but equally beautiful work. Painted for the Medici family, Mary wears an elegant red damask gown; the fringe of pearls dripping from her cloak is echoed in the tiny dots on the edge of the baby's sheer shirt. Somewhat unusually here, Jesus' garment stops at his hip, exposing his genitalia, reminding us that he is truly human as well as divine. 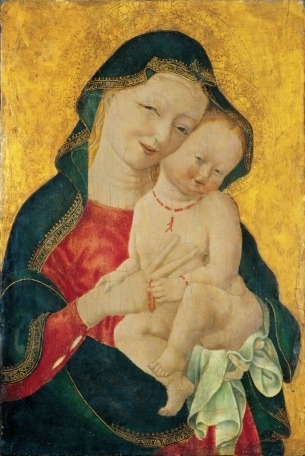 Mary holds her baby close, cheek to cheek, in a tender pose that is seen again, not very far away, in a "Madonna and Child" (c. 1450) by an unnamed artist known as the Master of the Winking Eyes. But with a difference. In the Master's work (at left), Mary seems to have tickled a rosy-cheeked Jesus. As there's no such incident in Scripture, the painter seems to have imagined the sweet moment—an everyday occurrence for most mothers and so, too, for Mary. It made me wonder what else this painter might have done, but I could find no other attribution to him (the artist could be a woman, but given the era that would be unlikely). Msgr. Verdon has added to the charm by providing another example of this unusual depiction: Andrea Pisano's "Madonna and Child," a marble bas-relief dated 1340, catches Mary in the act. Jesus giggles as he tries to move her hand away. These works, like nearly 40 others in "Picturing Mary," have never been shown in the U.S. before. The exhibition presents another fascinating twinning of works: "Madonna and Child in a Garden" (c. 1460-70) by Cosmè Tura, lent by the National Gallery of Art in Washington, shows a watchful Mary seated on a bench, with Jesus asleep at her knee. Above his head are her noticeably elongated hands, with four fingers touching to form a steeple. This painting hangs next to a terra cotta of virtually the same central image, attributed to Tura and dated about 1460-70, sent from Italy by the Grimaldi Fava Collection. Neither owner knew of the existence of the other work, but here they offer the opportunity to compare and contrast the results of an artist experimenting with the same image in two mediums. What of the works by women artists here? Some seem mere curiosities. There are six large paintings by Orsola Maddalena Caccia, an Ursuline nun trained by her father. She ran a thriving business, even taking commissions. Caccia generally loads her canvases with too many figures, and even different scenes, but her most successful one, "The Birth of St. John the Baptist" (c. 1635), manages to hang together, mostly. My favorite of the works by women is Sofonisba Anguissola's "Self-Portrait at the Easel" (1556). Essentially a business card for the painter, it shows her, dressed in finery, completely assured in her work on a Madonna and Child image. Michelangelo was among those who praised her work, according to the catalog. "Picturing Mary" unfolds thematically—"Madonna and Child," "Woman and Mother," "Mary As Idea," and so forth—rather than chronologically or as a narrative of Mary's life. At first, the categorizations often seemed arbitrary and even bothersome—why is one "Annunciation" here and another there? In retrospect, this reshuffling of familiar and not-so-familiar scenes invites closer examination of the works on view. That's a plus, not a minus.